The sustained and systematic study of film festivals has expanded rapidly in recent years. Over the past decade the volume of rigorous academic research on film festivals has grown exponentially, with a number of anthologies and monographs in particular helping to delineate key issues for the field. A driving force behind this recent surge in publications has been the Centre for Film Studies at St Andrews University and its publishing house St Andrews Film Studies (StAFS). Since its founding in 2009, StAFS has contributed the field-defining Film Festival Yearbook series (now up to its fifth instalment) as well as a number of stand-alone anthologies and monographs that examine a range of key issues for film festival studies. Alex Fischer’s Sustainable Projections marks a further addition to the StAFS’s expanding catalogue of publications, offering an important addition to the field of film festival studies through providing a more practice-based approach to festival research. 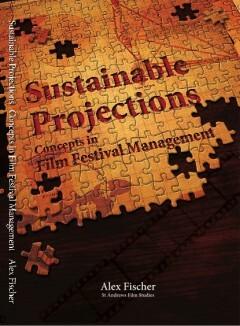 Beginning as a PhD thesis, Fischer’s Sustainable Projections: Concepts in Film Festival Management draws on close to a decade of research, interviews and personal experience to analyse and map film festival operational structures. The book offers insight into the complex nature of film festival operation and management, providing a systematic approach to analysing and charting how festivals work at a basic and, necessarily, generalised level – after all, as Fischer argues, the experiences of no two festivals are ever exactly alike. Examining the various social, operational and financial elements that enable and sometimes impede festivals operation, Fischer proposes that festival management can best be understood through the application of Open System Theory. Highlighting the dependence of these events on their environment and their ability to secure resources from external sources, Fisher identifies the many elements and participants that interact to form a functional and sustainable film festival. Through tracing the components of successful film festival operations, Fischer’s work suggests an ‘ideal best-practice’ for film festival management while acknowledging the various elements of film festival operation that make such an ideal unlikely, if not impossible. Fischer’s analysis of film festival management unfolds across four chapters and is bracketed by a short forward and conclusion. Chapter 1 begins by establishing the inherent interconnectedness of film festival operation. Dispelling the myth that film festivals are organic organisations born of a neat series of social and business connections, Fischer charts the intricate web of interactions, dependencies and co-dependencies that enable festivals to function. Chapter 2 expands on the complex nature of film festival inner workings, looking to Open System Theory as a means of framing and understanding the various flows of resources, energy and gratification that operate within the festival space. Fischer emphases the renewal of resources and inputs into the festival system – what he defines as negative entropy – as the key to establishing such events as sustainable and well-functioning open systems. Building on this, chapter 3 proposes eight strategies utilised by festival operators to enable and promote stable resource importation and renewal within their organisations. The theoretical framework mapped over the course of the first three chapters is supported throughout by anecdotes and quotes from festival researchers and individuals tied to notable international events, each of whom validate Fischer’s observations of the complexity of festival systems. Chapter 4 expands on this, taking the practical application of Fischer’s approach to festival management a step further. Detailing his experience with the Gold Coast Film Fantastic event, Fischer rounds out his volume with a case study of an event that benefited from the application of the knowledge, strategies and processes discussed in chapters 1 through 3. Sustainable Projections is not for the uninitiated. To get the most from this volume a certain level of familiarity with the operation of film festivals, from either a practical or academic perspective, is best. As Fischer attests, the book is not a DIY guide to organising a film festival – indeed, he suggests “festival organisers should have a healthy scepticism of any one-size-fits all notions of ‘the best’ way to run an event” (xii). Rather, for the initiated, what the book offers is more along the lines of a suggested approach to managerial best practice. Through clarifying the elements that compose festival operation, Fischer hopes to illuminate a means for better understanding what is, or might be, required by a festival to achieve sustainability. Much of what Fischer examines is therefore not utterly new or foreign information about festivals – for those involved in festival organisations the experiences covered within the volume will be familiar. What is ‘new’ about Fischer’s work, however, is how this information is organised and collated. What Fischer presents is a new way of thinking about the elements, trials and tribulations involved in festival management, highlighting those elements that are identifiably present within all successful and sustainably functioning film festivals. Returning to the context of the book’s publication, there is one further point that warrants attention. While the book is a substantially re-worked version of Fischer’s 2009 doctoral thesis, the monograph also appears as the first instalment of a new StAFS series entitled ‘Films Need Festivals, Festivals Need Films.’ This new series, advertised within the book as working to “improve the understanding of the way films travel through the festival circuit” (143), refocuses attention on the base elements of festival operation – the accessing, sharing and renewing of resources required for events to function. As the first instalment, Fischer’s contribution establishes a key audience and space for future volumes in this series. Addressing an area that appeals and applies to both academics and industry provides an interesting direction for future publications and opens up opportunities for more practice based research to enter into the ever growing field of film festivals studies. This volume will be of particular use within undergraduate courses on film festivals.